Irish tea towel features a selection of Murphy's laws. Beauty is only skin deep, ugliness goes to the bone. To get a bank loan, you must first prove that you don't need it. If all's going well, you obviously haven't a clue about what's going on. Things enjoyable in life are either illegal, immoral or fattening. 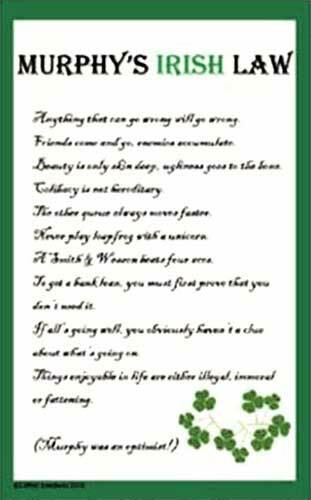 This Irish tea towel features a collection of adages from Murphy's Law that is enhanced with shamrocks. The Irish kitchen towel is 100% cotton and it measures 18" x 30". The Murphy's law tea towel is made in Ireland by Liffey Artefacts and it is complete with a shamrock history card, complements of The Irish Gift House. Irish tea towel features a map of Ireland along with icons and a blessing. Tea towel features a popular Irish blessing in conjunction with detailed Celtic knot-work. Irish kitchen set features a tea towel and a matching pot holder that are both enhanced with the Irish blessing. Irish kitchen set features a tea towel and pot holder that are enhanced with Irish icons that include the Claddagh and shamrock. Irish tea towel is enhanced with Celtic knot-work and features the shamrock and Claddagh along with the Celtic cross and harp. Tea towel features the Irish blessing that is enhanced with a Celtic knot motif.